Cajun born from Kaplan Louisiana, singer/songwriter Cedric Benoit can squeeze a box with the best in the business! 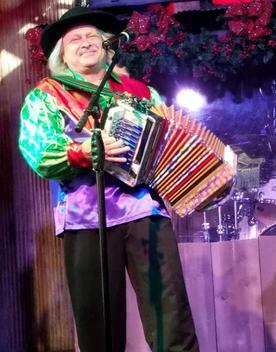 Cedric has a musical style all his own and with some lyrical content in Cajun French/English. Benoit’s fans refer to his musical body of work as “Cedric Music”. Growing up in Louisiana where musical styles and influences range from Cajun to Zydeco, Blues to Jazz, Southern Rock to Country. The possibilities of songwriting are endless. On any given day around the Kaplan area one may observe a crop duster flying over a rice field, crawfish traps all in a row, an abundant variety of waterfowl and much more. Highway 14 can take you to Delcambre where shrimp boats line up ready to get the big catch of the day! Head the other way and you’ll end up in Gueydan, the “Duck Capitol of the World", and eventually Lake Arthur. A little further south in Cow Island, Forked Island, Pecan Island and Grand Chenier you can witness hundreds of alligators catching some sun and enjoying the heat and humidity south Louisiana is known for. All of this only about 20 miles south of the Cajun Capital “Lafayette”. About 3 hours from Kaplan is the most magical city in the world, New Orleans. The “Big Easy” or “The Crescent City”, New Orleans is the birthplace of Jazz where Mardi Gras is king and home of the New Orleans Saints and the “Who Dat” nation!!! Louisiana paints a picture of Spanish moss hanging from beautiful oak trees, swamps that offer scenic possibilities that are a photographers dream. All of this has created the canvas which Cedric Benoit uses to paint his lyrical and musical body of work.